In the 21st century, who really has time to be a pilgrim? The world moves quickly, and finding four weeks to walk across northern Spain on the famed Camino de Santiago is, for many people, a step too far. But Christendom’s most famous pilgrimage – to the resting place of the Apostle James in the cathedral at Santiago de Compostela – needn’t be such a commitment. Camino regulations permit people to cycle the route, although the final 100 kilometres into Santiago must be walked to be officially sanctioned as a pilgrim. On a cool morning beside Leon’s cathedral, there are at least 20 bicycles in the plaza, all laden and bound for Santiago. We’re about halfway along the Camino Frances, the most popular of the web of trails that comprise the Camino de Santiago. This is my starting point. For the next five days I’ll be the pilgrim in Lycra, pedalling 350 kilometres west to Santiago, following the line of scallop shells that symbolise St James and the route of the Camino. Leon is a bittersweet place for many pilgrims, situated in the Camino’s most tedious stretch: the high, dry plateau known as the Meseta. It is far from the Spain seen in brochures. With its flat terrain and dry, clumpy fields, it could almost be a scene from outback NSW, were it not for the storks nesting in church bell towers. 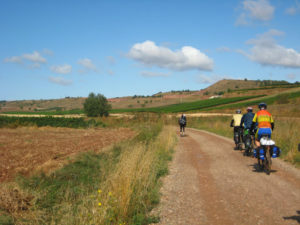 Many walkers choose to skip much of the Meseta, travelling by bus from Burgos to Leon. But for me, on a bike, it represents just one day, a warm-up ahead of the hills to come through Galicia. At times the road stretches mercilessly, unbending for kilometres, but it’s flat. On a bike, sometimes that’s all you need. The Meseta ends early the next morning, past the city of Astorga, with its confectionery-like cathedral and a bishop’s palace bearing the curves typical of its famous designer, Antoni Gaudi. At the plateau’s end, the Montes de Leon rise about 600 metres. This range is the scene of one of the Tour of Spain’s most famous climbs, and I ascend little quicker than the walkers around me. The descent, of course, will be a different matter. At the top of the Montes de Leon I follow one of the Camino’s oldest traditions, placing a pebble atop the enormous pile of stones around the base of the Cruz de Ferro cross. I feel even more blessed, however, by a message somebody has scratched into a nearby fence post: “May the wind always be at your back.” It is today. On the descent, free-wheeling past footsore walkers with 15 or 20 kilograms of gear on their backs, I feel moments of guilt. Cycling the Camino is a little akin to speed-dating St James, but inside half an hour I’ve covered the 20 kilometres to Molinaseca with barely a turn of the pedals. It will take most walkers another four hours to reach this riverside town from Cruz de Ferro. I might be gaining less karmic credit on a bike, but I’m also not getting blisters and a limp. To me, it seems an acceptable compromise. From Molinaseca, it’s a short ride into Ponferrada, the nearest point to Santiago de Compostela – 200 kilometres – at which cyclists can begin their journeys to qualify as pilgrims. Out of the city, with its castle built by the Knights Templar, it’s an undulating finish to the day, rolling through the Bierzo wine region. Unlike an earlier section of the Camino through La Rioja, the fountains here don’t dispense wine for pilgrims. It’s a pity because after 80 kilometres of riding and 1000 metres of climbing this day, I could do with a glass of chilled godello, one of Bierzo’s drops of choice. Tonight we stay in the town of Villafranca del Bierzo, at the foot of the Camino’s most notorious ascent: O Cebreiro, a climb of 800 metres over 10 kilometres. My cycling partner, Ramon, raced for a professional team for five years, so when he says the climb will be “very tough”, I believe him. The spectre of the climb prompts us to set out at a more pilgrim-like hour the next morning. On previous days we’ve dawdled over breakfast until 8am, watching walkers pour past our hotels long before we’ve even sat down to our coffee. From Villafranca del Bierzo, in contrast, we’re away 30 minutes before sunrise, setting out beneath a salmon-coloured sky, but still weaving through dozens of walkers who’ve beaten us out of bed. Temporarily the route is flat, following the banks of the Rio Valcarce, showered by autumnal birch leaves. At the village of Herrerias, fortified by caffeine, we begin the Camino’s legendary climb, ascending slopes laden with chestnuts. Within minutes we’re passing cyclists who’ve stopped to push their bikes – they’re in for a long day. After a hot hour on the slopes, we finally rise to the cold heights of cobblestoned O Cebreiro, from where the region of Galicia can be seen stretching out below. For a short time the trail bobs along the top of the range, providing short, sharp, thigh-tearing ascents that eventually prove too much. I hop off and push the final metres into Alto de Poio. I’m not alone. At a cafe at the top, I watch as every other cyclist behind us pushes over this cruellest of crests. “It’s impossible,” I hear one mutter. On the descent into Galicia we fall in for a while with a group of Spanish cyclists who’ve ridden for a week from Roncesvalles. In the dry conditions, we hurtle down the range at unholy speeds, churning up a storm of dust, arriving brown and gritty into Galicia. Here, in the wet and hilly region at Spain’s north-western tip, the land is suddenly green. Hill climbs are now queued ahead of us – it will be a tough final 150 kilometres into Santiago – but we’ll be surrounded by great beauty. It’s like the Garden of Eden here compared with the Meseta, with the forest at times almost reclaiming the trails. We stop the night at Portomarin, a pretty, arcaded town set high on a hillside after the original, lower town was flooded to create a dam in the 1960s. Buildings were transported brick by brick up the hill and, even today, numbers remain visible on the bricks of the cathedral from its jigsaw-like reconstruction. The next morning I wake with pilgrim’s legs, tired from two days of big climbs, though I’m still doing better than most of the walkers around me. It’s raining, and suddenly, almost every one of them looks exhausted. At least half seem to be hobbling – there are walkers with feet so bandaged they look mummified – worn down by the kilometres behind them and the distance ahead. Santiago feels close, though for those on foot it’s still days away. We stop for lunch at a traditional Galician pulperia (octopus restaurant) in Melide, washing down fried octopus with a beer and a brandy. Of course, this induces the need for a siesta, but the pilgrimage must go on. We return to the scallop-shell highway, riding through quiet Galician landscapes that switch regularly between deep, vine-tangled forest and the bucolic emptiness of dairy farms. In the end, Santiago de Compostela is an elusive destination, hiding among its surround of hills. Even just five kilometres out, as the Camino continues to rise, the city is far from view. Finally, the trail rises onto Monte do Gozo, its summit a gathering ground of pilgrims delaying their final steps towards their goal and their lives beyond the pilgrimage. There’s no chorus of angels to welcome us through Santiago’s suburbs, just the blast of traffic. They are the busiest streets since Leon, but finally they filter into Santiago’s pedestrianised old town and the vast Praza do Obradoiro square. At the square’s heart, beside the cathedral with its stone as weathered as the faces of the pilgrims, one final scallop shell is engraved into the ancient cobblestones, marking the Camino’s end. Walkers lie sprawled on the ground, as though too exhausted to continue another step. I’ve completed my pilgrimage, but my feet don’t hurt a bit.